16 sovepladser, Infinity Pool, Traditionel BBQ, I en blindgyde, Familie Paradise. Rocky Mansion (390 kvadratmeter) er en elegant og rummelig familie villa, der vender mod syd i en privilegeret vind-beskyttet beliggenhed over den vidunderlige gyldne sand Agrari Beach med storslået udsigt over Det Ægæiske Hav. Skønt beliggende kun 10 minutter i bil fra byen, er ejendommen tilbyder ro, privatliv og fantastiske natur. Agrari Beach, med sin intime charme og krystalklart vand, er bare en hurtig 10 min gåtur ned ad bakke. Villaens charmerende interiør, schemed i lyseblå, hvid og okker, kunne beskrives som "strandhus stil" kombinerer traditionelle elementer af kykladisk arkitektur med provinsielle udvalgte detaljer. De udendørs rum af Rocky Mansion, omgivet af klippefyldte bakker og Middelhavet urter, omfavne den sande ånd af sommeren liv som de tillader at leve hvert øjeblik af dagen i total komfort og afslapning. En vifte af to-niveau opholdsafdeling og en særskilt spisestue / lounge pergola-skraverede område, parret med en sten-skulpturelle spisebord og en traditionel træ brand BBQ, tilbyder gæsterne et perfekt underholdende område. En elegant infinity pool omgivet af en meget rummelig solterrasse med komfortable sommer møbler dominerer villaens terrasse godt ledsaget af en overdækket pergola giver skygge. Det fuldt udstyret køkken med moderne apparater giver på en behagelig stue-sidde plads direkte adgang til swimmingpoolen og dens brede terrasser. Great villa to relax with a bunch of friends or family. The villa offers amazing views and great outdoor area to relax and enjoy mykonos. We had an amazing time and would love to go back. Great staff as well!! 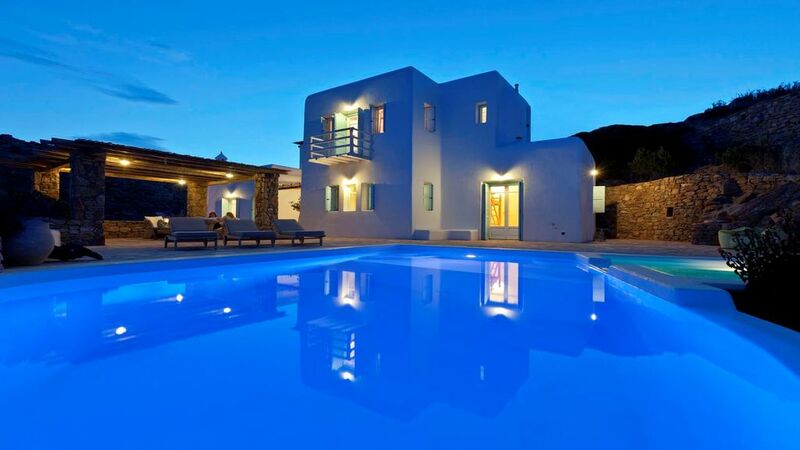 Rocky Mansion is a perfect villa for your stay in Mykonos. It's authentically Greek with a breathtaking view over Aegean Sea. The villa is well equipped with everything you may need and stays away from touristic crowds, however it's still very well located. Only about 10-15 minutes from the airport, town and the beaches. The concierge and cleaning lady were very welcoming and helpful. House is spacious, clean and has amazing outdoor facilities with infinity pool. Our stay at Rocky mansion was unforgettable for its incredible scenery, beautiful sunrise and sunset and magical nights with full moon above Aegean Sea were just breathtaking. We truly enjoyed our stay and every time when returning back to villa, it felt like coming back home. It's a very warm place with an amazing atmosphere. It was really great to host you ar RockyMansion for 4 days. You were great guests! easy going and respectful of the place. It was a pleasure being your host and you are very welcome to come again! I would definitely recommend you to any other host! RockyMansion is a fantastic, recently decorated and very stylish villa with an amazing and breath-taking view! The beach is just 5 min away, and in my opinion is one of the best in Mykonos. with all the information about the villa and the island. making our short stay really relaxing and problems-free. Definitely recommended, for both big group of friends or relaxing family holidays. We had such an incredible stay at Rocky Mansion. The house and facilities are incredible, totally exceeded all expectations and the place is actually much bigger than we thought it would be from photographs. George set us up completely before we arrived and put us in touch with Victor, the private concierge who is on hand for any questions, help or to give any advice before and during the stay. Victor helped with travel, restaurant, club and beach bookings - it made everything so much easier for our large group, even though we were very self sufficient already. There is a housekeeper who lives next to the house, Ida, who is wonderful. She kept everywhere spotless and almost became like one of the family, without being intrusive. I would 100% recommend George and the service he offers - it was the best holiday we had. If we plan another Mykonos trip, I will definitely be in touch. Elizabeth and her group were great guests ! Friendly, easy going, polite and also very responsible to leave the apartment in perfect condition. Happy to welcome them back again. Highly recommend to any other hosts on Homeaway !! Do not look any further just book. We are fortunate enough to have stayed in many top resorts throughout the world and this villa is certainly there with the best of them. From speaking and booking with George, immediately you know that this place is all about you and ensuring you get the personal treatment. The outdoor entertainment area is NOT as amazing as the pictures on the website !!! It is just so much better.!! We have vowed to return with friends and family and enjoy all the amenities that the villa offer. The owners George and Christina have opened up their home so you can enjoy what they have created. Think Asia and Morocco and the tranquility and relaxation of a 5 star Thailand resort in a bundle. Everything they do is to ensure you have the best possible experience. Your group was Friendly, easy going, polite and also very responsible to leave the apartment in perfect condition. Happy to welcome you back again. Highly recommend to any other hosts on Homeaway ! Kombiner den unikke Mykonos oplevelse med en eksklusiv luksus indkvartering og leve dit eget myte i Grækenland!